The reference above published in 2014 is a thorough clinical review of current understanding of Asthma pathogenesis and novel drugs for treatment. Needless to say, Asthma presents one of the most prominent unmet medical needs.It affects an large and increasing amount of people worldwide. According to Statista, top 10 respiratory drugs in the US generated 18.6 billions revenue between 2014.11 – 2015.10. 7 of them are $1B blockbusters. One of them is a generic. Medical Marketing & Media. Top 20 respiratory products in the U.S. based on revenue in 2014-2015 (in million U.S. dollars). 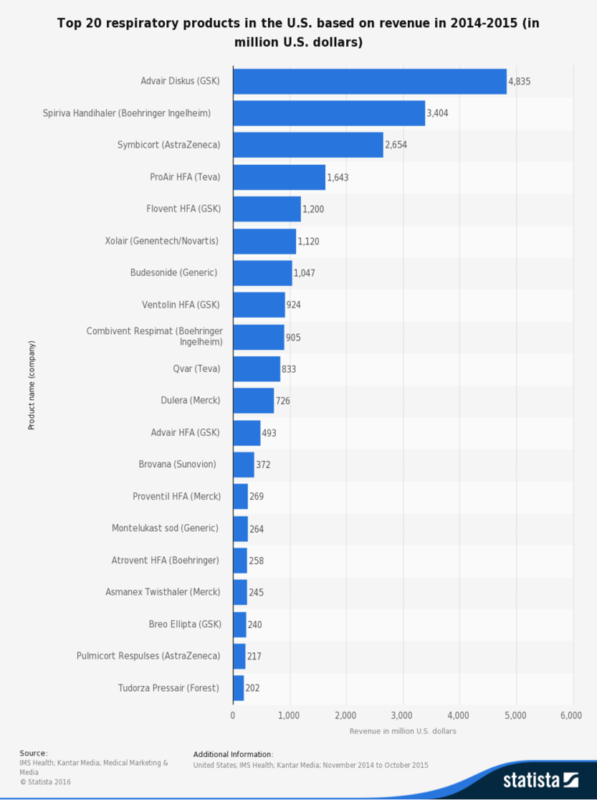 https://www.statista.com/statistics/318251/revenue-of-top-20-respiratory-products-in-the-us/ (accessed October 23, 2016). SOC: Relieve the symptoms, but not the disease. According to NIH guide lines on Asthma management, patients are recommended to take inhaled short-acting beta2-agonist (SABA), inceasing doses of inhaled corticosteroid (ICS), inhaled long-acting beta2-agonist (LABA) or leukotriene receptor antagonist (LTRA), based on the severity of disease. Unfortunately, all these money-making drugs only relieve the symptoms, but cannot cure the disease. Rather, patients have to “manage” the disease through their entire life. Their quality of life, chance of morbidity and financial burden is daunting. Current drugs only prevents the airway contraction through repressive mechanisms, when the symptoms happens. None of them touch the cause of those deadly symptoms — a lung that is super sensitive to environmental stimuli such as allergens. Now the Asthma field start to believe more and more so called “Hygiene Hypothesis”. According to the ‘hygiene hypothesis’, the decreasing incidence of infections in western countries and more recently in developing countries is at the origin of the increasing incidence of both autoimmune and allergic diseases. — Okada et al 2010 Clin. Exp. Immunol. Grew up in super clean environment, Asthma patients lung immune system are not well “educated”, and become imbalanced and allergic to stimuli. In order to cure the disease, we have to reeducate the immune system and knock it back to balance. In the hygience hypothesis, our lung immune system never see “dirty” bacteria and become allergic. To educate the immune system, we need to show our lung some “dirty” staff. We cannot just blow “dirty” bacteria into people’s lung. It is hard to control and may do more harm then good. But we can put purified bacteria components, especially the components our immune system recognizes as “warning signs”. After some trial and error, now the most promising drug candidate with “hygiene hypothesis” is CpG Oligonucleotides (CpG ODNs, Kline et al. 1998; Fonseca and Kline 2009), ligands that bind to Toll-like receptor 9. CpG ODNs are unique molecular patterns only found in bacterial DNA. Our immune system senses it as a “warning sign” for the presence of bacteria. Simply put, CpG ODNs are “dirty” and “pure” at the same time. They represent the dirtiness of bacteria and rebalance the immune system. In the mean time, they are synthesized highly purified molecules that only does what is supposed to do without any other harmful consequence of a dirty bacteria load. Cytos Biotechnology was the front runner of CpG ODN in Asthma. Their lead candidate CYT003-QbG10 nanoparticle showed promising results in early clinical trial. Unfortunately, it failed badly in phase IIb in April 2014 (Results published here: Casale et al. 2015 Allergy ). As a result, Cytos had to liquidate itself and merged into Kuros Biosciences. The drug candidate CYT003-QbG10 was then licensed to other biotech companies, including Arbutus for HBV and Checkmate for Cancer Immunotherapy endeavors. In my opinion, the biggest problem with CYT003-QbG10 is its route of administration. Like many early research and development efforts with CpG ODNs in Asthma (Sur et al 1999), CYT003-QbG10 is administered subcutaneously (subQ). The drug enters the whole body circulation system through blood. It interacts with entire immune system. The investigators probably hoped a systemic response will also affect the lung. Unfortunately, that was not what has happened. It had minimal effects on the lung. There is nothing wrong with the hygiene hypothesis; there is nothing wrong with CpG ODNs. It’s the route of administration. To balance the lung immune system, we have to go to the lung directly. Recent Asthma research in mouse models has shifted the delivery route from intraperitoneal or subcutaneously to intranasal. All suggests Intranasal pulmonary route give a much stronger therapeutic effects. We will find out in late 2017 or 2018. Let’s wait and see.